All religions have creation stories that explain the origins of evil and suffering. The Judeo-Christian story is distinctive at its outset, when God nonviolently creates order from disorder. In many other religious myth, the disorder is personified by monsters who are killed by gods. For example…. The Biblical creation is also distinctive in that it recognizes the importance of mimetic rivalry. 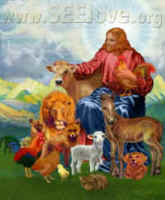 Adam, Eve, and all creatures initially lived together peacefully. There was no violence or death in the Garden. However, the snake tempted Eve, awakening desires that threaten the blissful harmony among all of the Garden’s inhabitants. Adam regarded Eve and mimetically desired the fruit. Adam and Eve were created in God’s image, and God’s love and care should have been their model. They should have striven to be like God in benevolent “dominion” over Eden. Instead, they looked to each other as models of desire. Eve craved the forbidden fruit because the snake encouraged her, and Adam wanted a taste because he saw Eve’s evident pleasure. Evidently, we humans seem attracted to physical models, and perhaps the only way that God could encourage us to model God would be for God to come to earth in human form. But, I’m getting ahead of the story. When caught by God, Adam blamed (scapegoated) Eve and then Eve blamed (scapegoated) the snake. The problem is that Adam and Eve were not modeling their behavior upon God and God’s will. Rather, they had become rivals with God for leadership in Eden, making it impossible to live in peace and harmony under God’s benevolent directorship. Adam and Eve were banned from Eden, and I see the ensuing consequences as descriptive, not proscriptive. In other words, what happened to Adam and Eve describes what happens when people refuse God’s love and instead crave God’s power. No longer supplied by God, Adam was forced to struggle to obtain food, clothing, and shelter. Physically weaker than Adam, Eve had to accept a subservient role to the man in the family. In the unharmonious, violent world outside Eden, social order (maintained by taboos) was needed to avoid divisive mimetic rivalry, but these taboos would undermine true love and compassion. Similarly, relationships with animals were broken. The Bible relates that humans would kick the head of the snake while the snake would bite the humans’ heal. This is the tragic, fallen world in which we live, a world that can only be redeemed and reclaim peace by the grace of God. One question that many theologians have pondered is why the tree of the knowledge of good and evil was forbidden. Today, we generally regard knowledge as desirable, and understanding good and evil is perhaps the most important knowledge of all. From a Girardian perspective (but not the only possible Girardian viewpoint), I offer an explanation. In the Garden of Eden, there was no violence because there were no rivalries. Everyone had everything they needed, and there was no scarcity that could lead to bitter disputes. What did Adam and Eve learn when they ate of the tree of knowledge of good and evil? Insofar as they desired to know good, they became rivals with God for leadership in Eden. In learning about evil, they learned about scarcity. Previously, they had no desires because they had no sense that what they wanted might not be available. Now, they desired things that they feared might become scarce. So, knowledge of evil would encourage them to want to have more—more than they really needed in order to thrive. If there were no real scarcity before, hoarding would certainly create scarcity. With scarcity, people would struggle—some to hoard more objects and some to merely survive—and conflicts would arise. The only way to restore peace would be to exile/murder a scapegoat. Such a world of violence would not be a Garden of Eden. Their knowledge of evil made it impossible for them to live in a truly harmonious world. Next week, we will explore the first murder and how this story differs from the myths of other religions.